Ustad Khamiso Khan Alghoza Instrument Master. 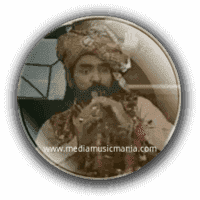 He was legendary Sindhi Alghoza, he was very popular Alghoza Sindhi Folk and he he create great name in Sindh Music. Ustad Khamiso Khan was very popular also in all over the World. Alghoza adopted by Sindhi, Rajastani and Baloch Folk Musicians, also called "Jorhi", "Do Nally", "Satara or Ngoze". It resembles a par of wooden flutes. The musician plays it by using three fingers on each side. Sound is generated by breathing into it rapidly and quick recapturing of breath on each beat creates a bouncing, swing rhythm. It is generally used as a folk instrument and Punjabi folk singers use it to play traditional music such as Jugni, Jind Mahi, and Mirza. Ustad Khamiso Khan Introduce Sindhi Kaafi's, Arfana Kalams in Alghoza Music. he played Classical music, Lok Music in Alghoza. I have selected below most popular Super Hit Alghoza songs of Khamiso Khan. Ustad Khamiso Khan was born in 1923 at Tando Muhammad Khan, Hyderabad Sindh, he learnt his art from Ustad Syed Ahmed Shah. Algoza is generally used as a Folk Instrument in Punjab and Sindh provinces. Ustad Khamiso Khan introduce Alghoza in all over the World, it is a pair of wooden flutes. It is also a popular choice among United Kingdom musicians for making contemporary Bhangra Music and figures as an important instrument in Rajhastan. Ustad Khamiso Khan was died on 08 March 1983.